No thanks, I don’t like beautiful jewelry. * Your privacy is very important to us. This 4mm wide titanium ring is perfect for ladies looking for a thinner look. 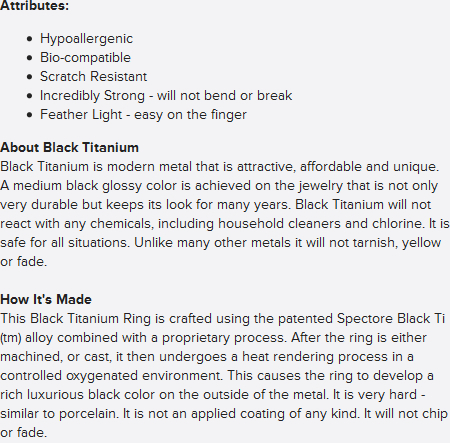 A .10ct round brilliant diamond is captivatingly held between the contoured black titanium ring. Even though it's not a big ring, it's sure to get lot's of compliments with the striking design. Please allow 2 - 3 weeks to make ring your finger size. I proposed to my fience with this ring on Christmas 2011. 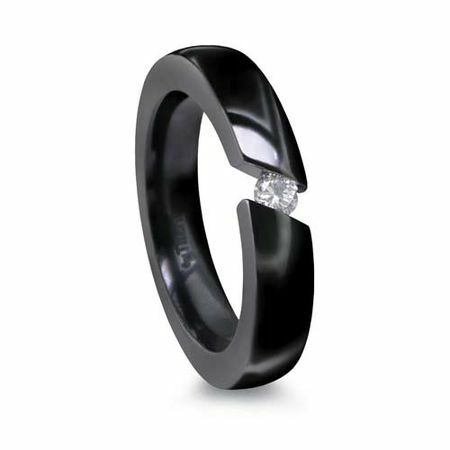 She always wanted a black engagement ring and absolutely loved this. I couldn't find rings anything like the ones I browsed here. This ring is soooo unique ! Especially as we used it as a wedding ring (people always ask me : is that your wedding ring ? wow, so original!) The good thing is that there is a male style, so my husband has the same ring as mine. Nothing bad to say at all about the ring [...]. Have bought several rings and they are all ways great! This ring is fantastic, it is pretty, stylish and it holds up very well under all kinds of abuse and still looks great! The product is an eyecatcher here in Norway! Because no one else have this product. I wanted something unique for my wedding band and I found it in this ring! They worked with me to customize my ring, so I have a 5mmm ring with a AAA quality pink sapphire stone. They only downside was about 1.5 weeks before the wedding, I hadn't received my ring yet and I called the company. They informed me that the stone had fallen out before they could ship it to me and were quickly making another one. Even with this set back, I had my ring in plenty of time for the wedding. Suffice to say, I am nervous about the stone falling out, which is a hazard with any tension set rings, so I am pretty careful at work and at home. Overall, I would definitely purchase again and again! When I opened the box I could not have been more pleased. It exceeded all my expectations. I have ordered this type of jewelery from other companies and I have always been disappointed. The finish and/or the overall quality was just bad. Some fell apart in a few weeks. Yes, they all had "Life Time" warrenties, but when the ring is returned, it must be in unworn condition. What good is that! Copyright Titanium-Jewelry.com. All rights reserved.